News of photography, plus gallery. In recent times, I’ve had little opportunity to take the camera out, but at the end of May we managed to have a five-night cruise over to France and up the River Seine. The first morning, we awoke to this view. While it was a shame not to be able to see much, I felt that the view was quite atmospheric. Also we were in luck as the mist cleared quite soon in the morning. The shrine is to the memory of St Joan of Arc in Rouen. Everywhere we looked there were memorials to her, from the shrine to a church and a museum. 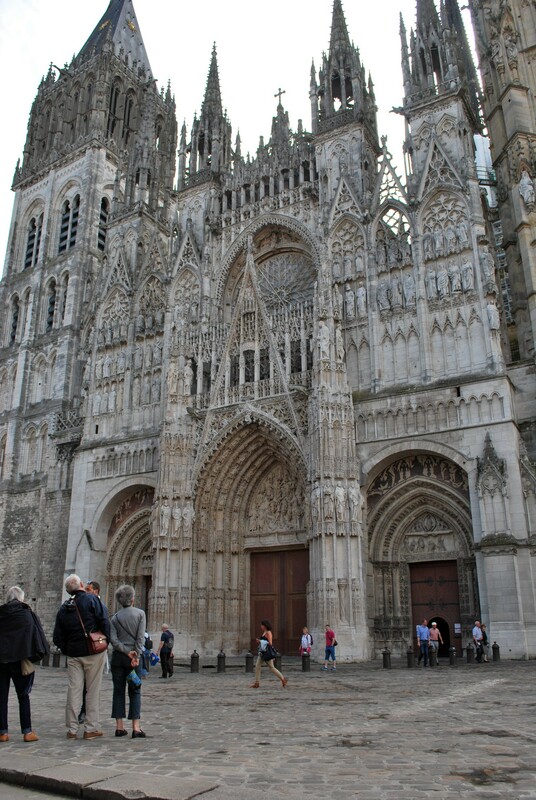 We also had a good look at the Cathedral in Rouen, which Monet loved to paint. He evidently painted it about 30 times. 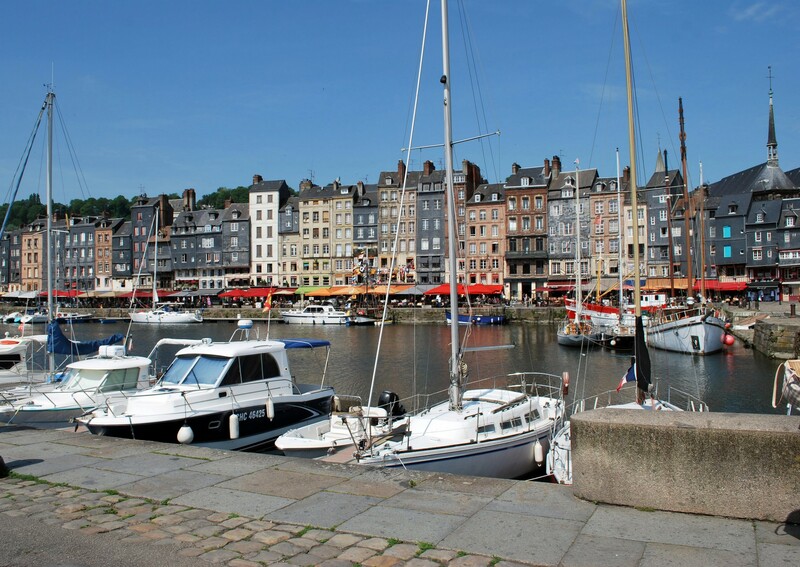 The ship was moored for 2 nights at Rouen, before sailing back down to the coast to our other destination – Honfleur. This is a very pretty port, much loved by impressionist painters. 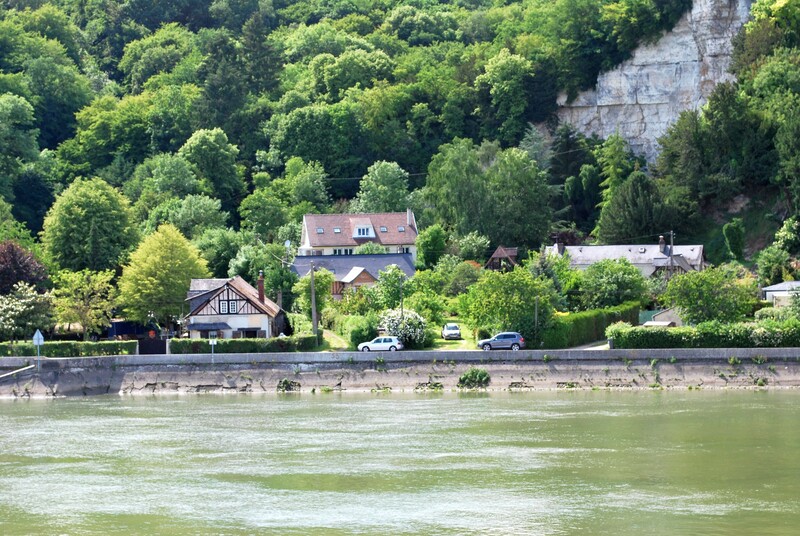 Before we arrived there we enjoyed the views of the banks of the Seine from the ship. It was soon back to reality, but we had enjoyed our break. For us it’s the only way we can travel now, transport directly from home to the port – Southampton – help for Mike to embark, and once settled in, he didn’t need to go ashore if his pain levels were too high. He needed to rest for the second day in Rouen. We didn’t go ashore at all that day, so I managed a short swim in the swimming pool on board. Hello folks, I have a confession to make. My camera has not been out of the house for well over two months. Time has just flown and the past few months have passed in a blur of appointments, professional visitors like physiotherapists, occupational therapists and workmen. Simply no time for photography. I’m pinching a bit of me time to write this as I don’t want to lose touch entirely with my blogging world. One thing I do have now is a smartphone. Yes, I’m being dragged into the modern age, but mainly I don’t use it as a smartphone but simply as my old mobile phone, but with one difference. It has a camera, and quite a decent one at that. Not exactly sure what I’m doing so far, but have taken one or two. 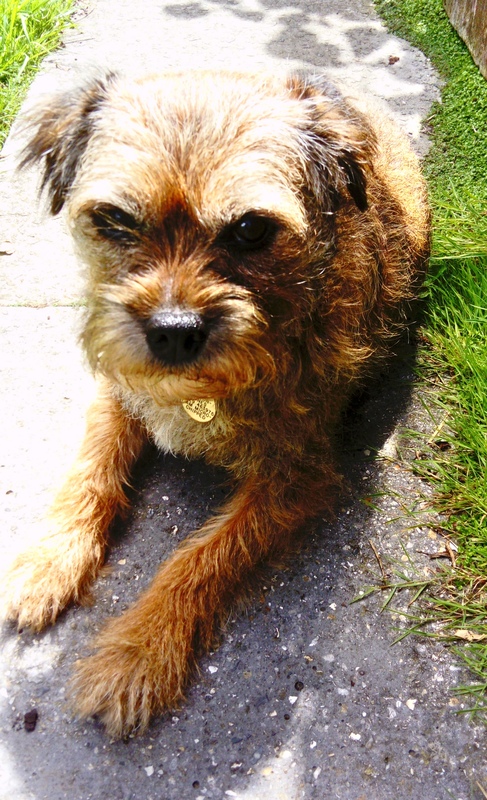 This is Tarka wondering what she should eat from the garden next! One of the reasons I bought this phone is that our photography group has closed for now, but our leader has said he may start up a new course later using smartphones, and since I needed a new model, it seemed the ideal time to invest. I hope to catch up a little with reading your various posts, but it will be slow progress. In the meantime, keep up the good work you all do with your blogs when life allows. Routine – Friend or Foe? Some people believe that sticking to a routine stifles creativity. Maybe if everything is regimented it does. However, I think that when times are difficult, familiarity can be comforting. Things work better, leaving time for other thoughts. What do you think about it? We all have to leave our comfort zones sometimes, but the everyday matters can be dealt with if we have a routine, so that they at least don’t worry us. It’s also good to leave your routines behind when you have a holiday or short break. Do something that you don’t normally do, and it gives you a lift. Dogs and other animals thrive on routine. I know that my Tarka knows what time her food is due, when she should go for a walk, and anything out of the routine can upset her until normality is restored. On a different note, the blossom on our cherry tree has been glorious this year. A couple of years ago we feared that it was dying, but it’s now making up for it. Likewise the magnolia tree. These beautiful flowers really lift the spirits after the dullness of winter, letting us know that we are really into spring now. Firstly I’d like to offer an apology to my followers on WordPress, and those I follow. If I haven’t visited your site, liked or commented for a while, it’s simply that I haven’t had time, with many other commitments and appointments. I’m not sure the situation will improve, but I’d like to assure you that I really enjoy reading the variety of blogs, and seeing some wonderful photographs too, so I’m really missing you all. We’ve had quite a few foggy days this winter, and that weather is not something I enjoy, don’t like driving in it either, but it does make for some atmospheric photographs. We had occasion to visit Dorchester, our County town, on one day like this, so I took the opportunity of visiting the gardens there and taking one or two photos. Tarka did not accompany us that day, as we had appointments, but she is continuing to hate other dogs, but be loving to all humans. No doubt she has her reasons. I’m continuing with her training, and she is a little better when passing other dogs on leads, as long as they don’t come too close. She is tending to ignore them more, which is fine by me. Her coat is very long at the moment, but I’ve decided that it will be cut soon as spring is arriving here. Finally, one showing our lovely coastline again, taken last week on a photography group meeting at Durlston Castle. One of the reasons for our visit to Kingston Lacy last month was to see the autumn colours before they disappear for the winter. Tarka was allowed into some areas, such as the Japanese garden, a particular favourite of mine. However, she could not reach the garden by the normal route, a few hundred yards away. She had to go round a couple of miles through pathways. She and I started off on the route, leaving Mike to browse closer to the main area as he cannot walk too far. Before too long though I hit a few hazards. In one field there were sheep, in another, and much closer to us, there were cattle, including some rather large bulls. As I’m aware how Tarka is with other dogs, I had no idea how she would react to cattle or sheep, even though she was on the lead of course. I certainly didn’t want to start a cattle stampede! Discretion became the better part of valour as the saying goes. We turned back, and found Mike in a place where he could sit with Tarka while I rushed down to the Japanese garden to take a look. I was not disappointed, especially as the sun was shining. Kingston Lacy has something to offer at each season, but autumn is usually the best. On my way back to the house and outbuildings where Mike and Tarka were waiting, I saw the lovely yellow rose. Could this be the last rose of summer? Tarka is coming along nicely. We still have issues with other dogs, but when our local field is not too occupied by others, I am now able to let her off the lead. She loves to chase birds, never catching them of course, but runs like the wind before returning to me for a well-earned treat. When we visited Cornwall in April, we had forgotten just how advanced the seasons can be in that part of the West Country. The rhododendrons in full bloom gave us a good reminder. This was taken in the grounds of Trelissick – a National Trust property. On previous visits, many years ago, the house was not open to the public. Now, however, parts are available to view. There are many repairs needed to the property, but more areas will be opened as and when these are done. The house has a lovely view across to the water. The above view was taken from just outside the house, looking towards Falmouth. We were not disappointed with our trip to Cornwall, and hope that it won’t be as long before we visit again. Hello again. I’ve been away from home for a couple of weeks, following which I have a lot to catch up with. Not only have I not been writing anything, I’ve also not been able to read any blogs; as my mother used to say I’m all behind like a cow’s tail. Anyway, I shall be trying to read all your blogs and also write something myself and post a few photographs. As if things are not slow enough, I have major problems with my laptop and am just putting off the day when I need to send it in for repair. I’ve tried fixing it myself but it has become too advanced for me now. These are a few more photos from our visit to Cornwall, all from St Just in Roseland church. Next time there will be more photos from Cornwall. Portscatho sits gently on top of the South Cornwall coast, with wonderful views in all directions. It has always been one of our favourite spots to visit when in Cornwall. There is a memorial there to the men who died in the Burma campaign, not easy to read,but I hope you can make out the words. The village caters well for holiday-makers and is popular with those walking the South West coastal path. We stayed at St Mawes; the day before we arrived they had a terrific storm, and we wondered if the weather would be kind. We arrived to find a calm sea, blue skies and only the aftermath of the storm to be seen. Several windows had been broken, and stones were strewn across the road. The men arrived with their JCB to clear it all away. Nothing can detract from the natural beauty of the area, and we so enjoyed our nostalgic trip.